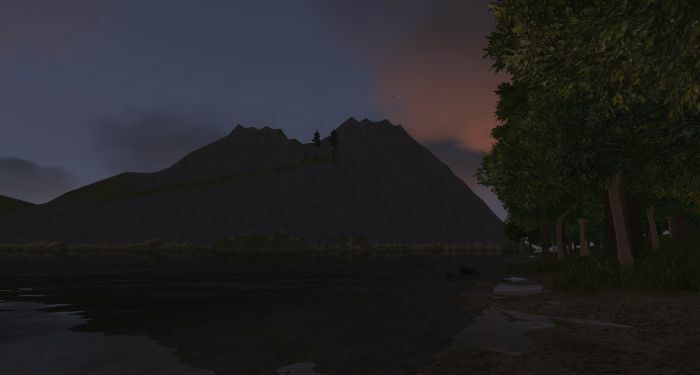 Lost, Dead, and Deeded #WurmOnline – Nomadic Gamers, eh! It took the better part of a day, but I now have my 4th deed on the new Celebration server. That’s four deeds in total, not my fourth on that specific server. The deed faces a beautiful river, that eventually winds its way to the starter village of ‘Tap Dance’ – the mountains pictured above are actually deeded by Moumix, I’m on a circular island just across the water. Starting from scratch has been interesting, a lot of things I forgot. Here’s how my day went. I arrived in Celebration, and turned East because I spotted a big island that way. Turns out I was not the only one, so I kept going. I found a really nice area that I was contemplating deeding, but I had taken over my weakest character, and Celebration is completely covered with very mean angry creatures. I tried to lure some away and failed. Died, spent an hour trying to walk back. There’s no map of this server yet so walking anywhere is a lot of guessing and me frantically sending screen shots to Moumix to figure out where I was. I managed to find my body (it helps that I stuck close to water) and to lessen my weight I dumped all of my tools into my boat. Then I continued exploring. I received a bad wound, and decided to bring my Fo priest over because she’s immune to most types of aggressive animals. I logged the alt with the bad wound out until the priest could arrive because the wound was getting worse. Priest arrived, healed the alt, decided to poke around on the priest. Then I started to realize just how busy the East coast was, and it was deterring me from settling in that area. After some talking with Moumix and me drooling over screen shots of his massive mountain (which has copper!) I decided to sail over to the island across from him. Of course, nothing is that simple. I loaded both characters into my sail boat, leaving the corbita behind. I got lost every step of the way, and a few hours later FINALLY had Moumix come out and rescue me, and show me where this island was. I wandered around, and fell in love with the quaint little area. It makes for a nice little country home that’s relatively flat and doesn’t require much terraforming. I haven’t decided what all I want to do with it yet. I started to get to work – and then realized that all of my tools were way back on the corbita that I had abandoned earlier. So I sailed back to get them after placing my deed. Then I decided to take the Fo priest back home to Deliverance to care for her animals, and leave the alt at the new deed. It was a really quick sail back, the wind was on my side (for once). Once I made it all the way back to Deliverance, I realized that my Fo priest was the mayor of the deed and I had not set permissions for my alt to do anything. So. I spent three hours sailing BACK to Celebration, against the wind, to give those permissions to the alt (and to make her mayor in 24 hours). I had just enough time to make a pen for some animals I found (a pregnant horse and 1 bull / 1 cow so far) and start a large cart. So which of your characters is going to be on Celebration? Also, I saw that Arysh had disbanded Darkpaw Bay – I thought that was your pride and you on Deli? @Xalorum – deed forms don’t transfer servers, so they vanish when you leave. I can manage it from the form in my inventory, when I’m on Celebration. But when I’m not, I can’t manage it. Can’t you manage those settings from the form in your inventory? Maybe I misunderstood.